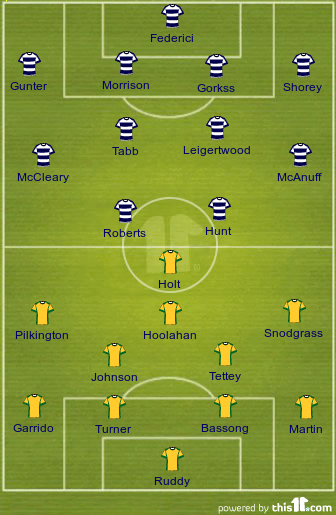 fanatix | Football | Premier League | Norwich City FC | Reading vs Norwich preview: Team news, predicted line-ups, squad sheets, match facts and more! Reading vs Norwich preview: Team news, predicted line-ups, squad sheets, match facts and more! Reading take on Norwich City still bidding to get their first win of the season. Check in to the game with the free fanatix app now for iPhone: Sport news, social features and more! The sides first met in the FA Cup in 1909 but this will be their first-ever top-flight meeting. Norwich drew 3-3 on their last visit to Reading, a Championship match they had led 3-1. They had to play the second half with 10 men after Grant Holt was harshly dismissed just before half-time. In 67 meetings, Reading have won 26 times compared to 24 victories for Norwich. Reading have taken the lead in five matches this season, drawing four and losing the other. They have also conceded 14 second-half goals – equal most in the division. The Royals have scored 23 goals in 12 league and cup games this season, averaging nearly two goals a game. Three Premier League clubs have previously avoided relegation after failing to win in their first 10 games of the season – Derby County in 2000-01, Everton in 1994-95, and Blackburn in 1996-97. Norwich are unbeaten in their past three Premier League games. After 10 matches last season, they had 13 Premier League points. This season, they have 10. They have only scored more than once in one of their 10 league matches so far this season.